When you like to cook, you’ll inevitably accumulate tools that you think will be useful but you never actually use. 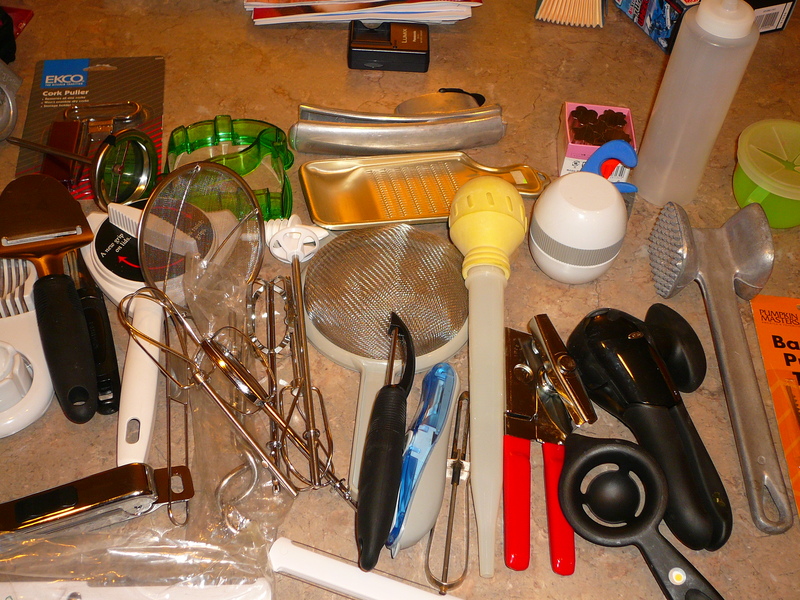 I did a recent purge of our kitchen gadgets and learned the following things. My husband really likes cheese. In one of our drawers, I found five cheese slicers (three of which were identical) and a hand crank cheese grater. We are obsessed with measuring. We had multiple sets of measuring cups starting at 1/4 cup all the way to 1 quart. There was a set that drove my husband crazy because the numbers had worn off them so he couldn’t tell which was which, but for some reason we kept them anyway–even though we had bought a replacement set. When you upgrade a gadget, get rid of the old one. I got a Microplane premium zester and grater a few months ago, which I love and constantly use. So why was the cheap knockoff version taking up space in my kitchen? Presses and spatulas are not our thing. I received a Vietnamese coffee press as a gift and held onto it for years even though I don’t drink coffee. I know many people swear by their garlic presses, but we never used the one we had. We also got rid of a wide spatula that was too big and unwieldy to be helpful and spatula tongs, which sound cool but really aren’t. If you can complete a food preparation task with a knife or your hands, there’s no need to buy gadgets like an egg separater, apple corer or cork puller (which I found brand new still in its package). Yesterday I ran into Lisa of Gluten Free Foodies, and she reminded me that this Saturday is the big “Will Bake for Food” event. 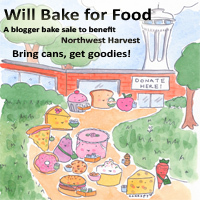 Lisa, along with 60 other Seattle food bloggers, is creating sweet treats for a giant bake sale benefitting hunger relief organization Northwest Harvest. The event will also feature a special raffle with awesome prizes, and blogger, chef and all around nice guy, Eric Rivera, is hiding a golden ticket inside one of his chocolate bars that will be good for a dinner for two cooked by Eric himself.